If it’s your first time going to a Radius Sunday morning gathering, we want to make sure you know what to expect and to feel comfortable. First, park in the guest parking area along Mirror Lake Dr. This will put you close to the building. 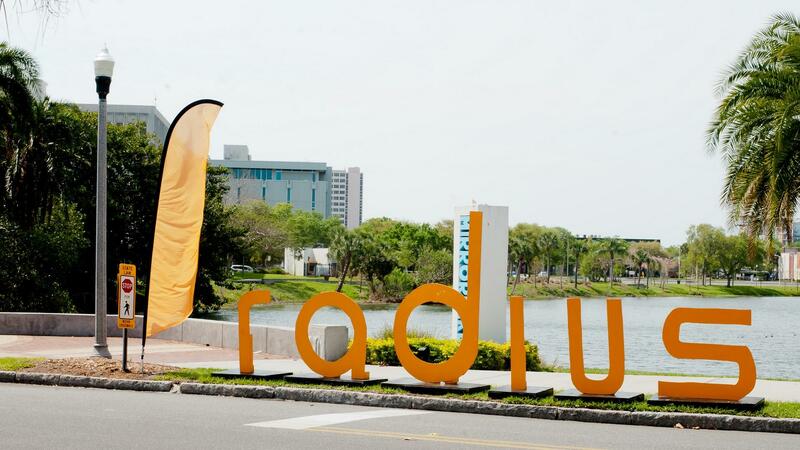 If you’d prefer not to park so close to the street, or there are no spots available, another convenient area is the lot between the Sunshine Center and the Shuffleboard Club building where Radius meets. Look for Radius signs to help direct you to parking, and the main entrance. Our parking team will be there to greet you and help you get where you need to go. You will see our orange welcome center tent outside the Sunshine Center that will highlight the entrance. Inside there will be people assisting at our welcome center- designated by a gray table cloth. This team can answer any questions you may have about the church and guide you to where you want to go. Grab some complimentary coffee and donuts in the cafe and head into the worship gathering space. If you have children, whether elementary-aged, preschool or toddler and infants, one of our welcome team members at the gray table can help direct you to the Radius Kids check in center. The Radius Kids also meet in the Sunshine Center building. Elementary aged meet downstairs in a room off of the courtyard. Preschool and nursery aged meet in rooms on the second floor that is easily reached by an elevator. In the respective rooms, you will be asked to sign your child into the class and to give a cell phone number where you can be reached for any need or emergency. The same parent to drop the child off will be asked to be present to pick the child up. A lot of people ask about what to wear, and we say- “Come as you are!” You’ll meet people here in shorts and flip flops, and some in dress pants and collared shirts. We want you to be you and to feel comfortable doing that. We gather every Sunday at 11:00 a.m. Find a seat and get comfortable. Our gathering starts with music and prayer, and ends with a teaching from the Bible. You can expect the gathering to be finished around 12:15 p.m. If you have children, their gathering will finish up at 12:15 p.m. as well. You can pick them up at the same Radius Kids gathering area where you dropped them off. We’d love to hang out with you afterwards and our pastor, Blake, would enjoy meeting you before you leave. He’ll be right outside by the welcome center.